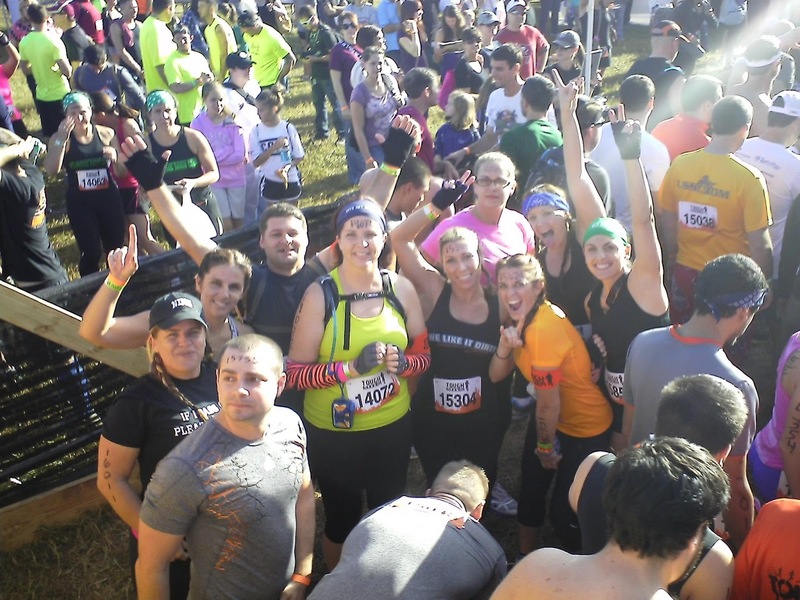 Mindy's fitness Journey: I Survived Tough Mudder! I Did It! I survived Tough Mudder! That means I can do anything! I still cannot believe that I did it! 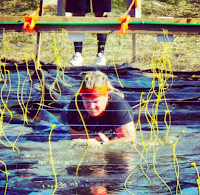 It was really tough and I conquered some serious fears! I still have one fear that I couldn't beat, so next year I will try again. 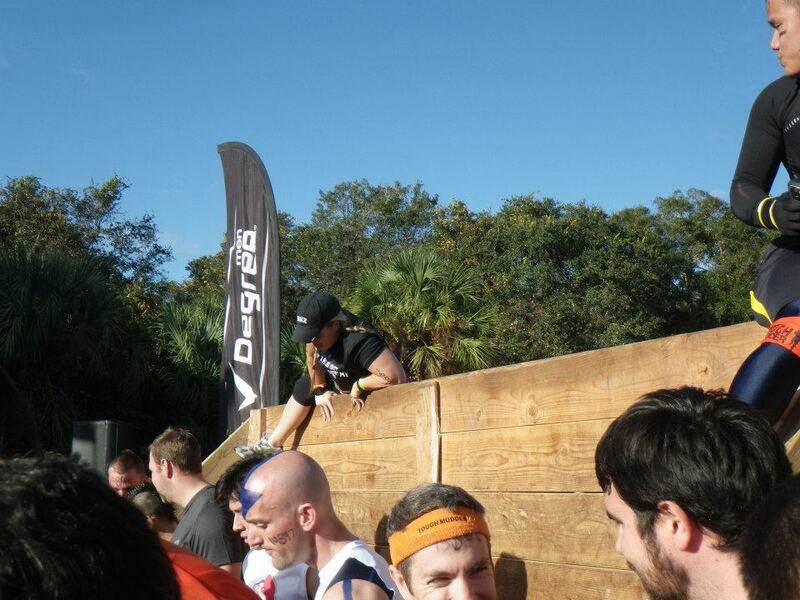 Climbing the wall to get to start! It was really surreal pulling up in the parking lot and seeing signs that reminded me that I signed a "death waiver!" I had serious butterflies in my belly! You have no idea!!! I decided that I would go with my usual hair in braids and a hat! I was sure I wouldn't lose that! LOL... um... sure! I lost my hat in the ice bath! Well to even get to the starting line, I had to climb a wall. I just remember thinking, oh boy here we go. When I jumped down, I realized that my achilles wasn't ready for me to do all that jumping. Oh well! 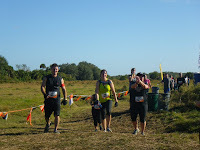 The end of the race! OUCH! We were so excited to start! When you look around and see that EVERYONE there is fit and strong and proud, it takes your breath away, especially when you are in the process of becoming all of those things. So honestly, right away, I began my self-sabotage. I started criticizing myself in my head... "Why haven't you lost more weight?" "Why aren't you are faster runner?" "What makes you think you can do this?" Ugh! Not good! Thankfully I have really supportive friends who pushed me through and made me feel pride! I did have to skip the underground tunnels due to my Claustrophobia. 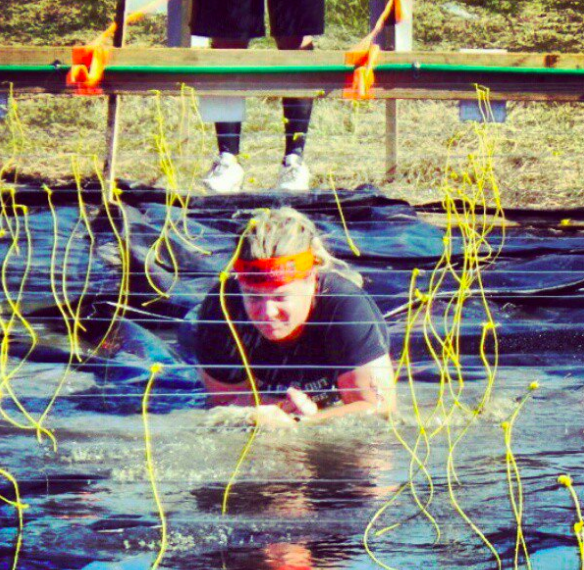 I need to thank Polar for sponsoring part of this race. I also need to thank Harold R. Without their help, I wouldn't have been able to run this race! Let me just tell you that I have a long way to go in this journey, but the girl who was sitting on the couch eating McDonalds at this time last year would have never seen this coming. If I can do this, ANYONE can!!! Conquer your fears! Be proud! Congrats on the awesome job you did on conquering your Tough Mudder!! That's amazing and you deserve to be very proud!! Thank you so much! I am! OMG congrats!!! My brother and his girlfriend want me to do a Toughmudder so badly, but I really don't think I can!!!!! I cannot swim and I am terrified of water, LOL! That just wouldn't work out too well. Well, if you can't swim and are terrified of water, you will have to skip a few lol... but you could conquer some fears!!! Woohoo girl! You are awesome! 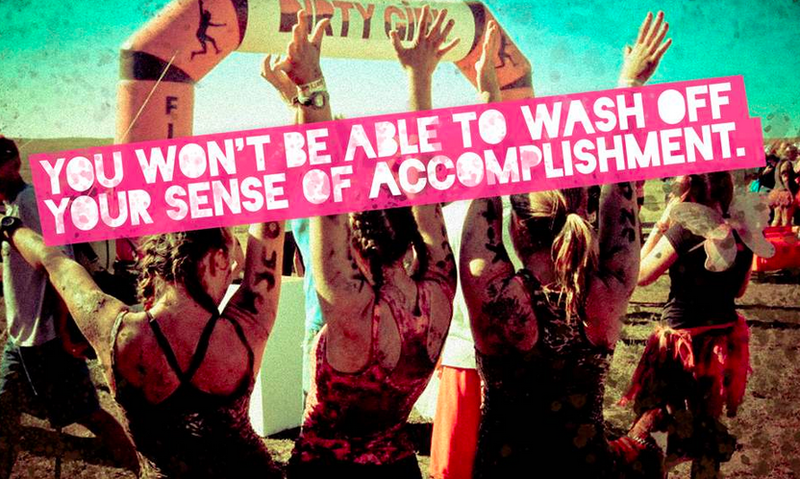 I haven't attempted a mud run yet...I'm too scared lol! Wow! That looks like quite an adventure! Congrats! Congrats! I did it in Atlanta and it is no joke!!! Wow, you did SO good! I can't imagine doing one of those races, although I have considered it! I definitely understand those negative thoughts when you start comparing yourself to others. I'm glad you didn't give in and listen to them. You rock, Mindy!! 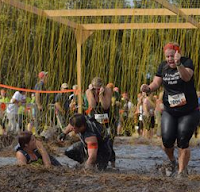 Enjoy it girl, nice job on Tough Mudder! Oh my gosh so amazing. I am scared of heights so jumping would be terrifying. Rock on! Just found out Pretty Muddy is coming here! Cool! Just came across your blog and enjoy it so much!! Im a single running momma in NC! This is way cool. 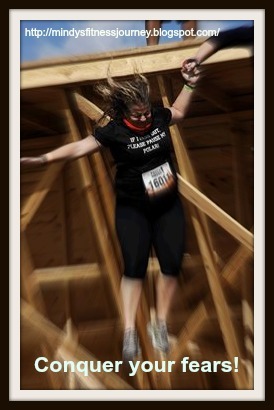 I've never attempted an obstacle course or mud run of any kind ...yet. If I were in Florida I would join you! But I'm up in NC. I'll have to find one around here. Looks like fun. Keep up the awesomeness woman!